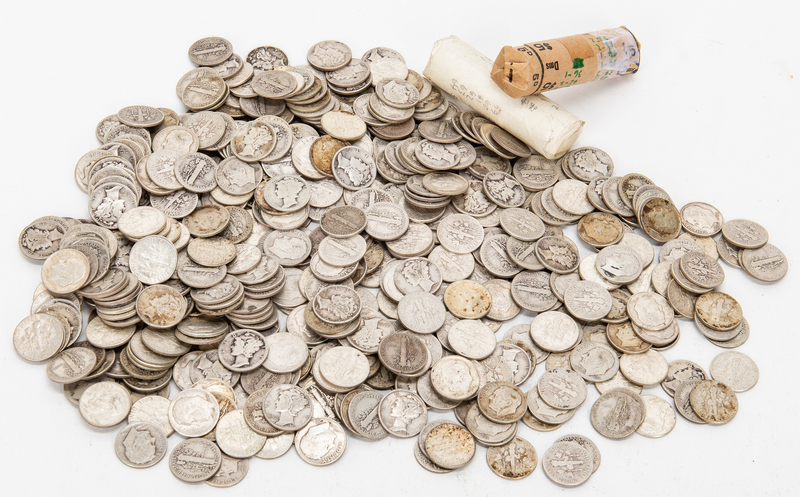 Five hundred and seventy-seven (577) Mercury and Roosevelt Silver Dimes. 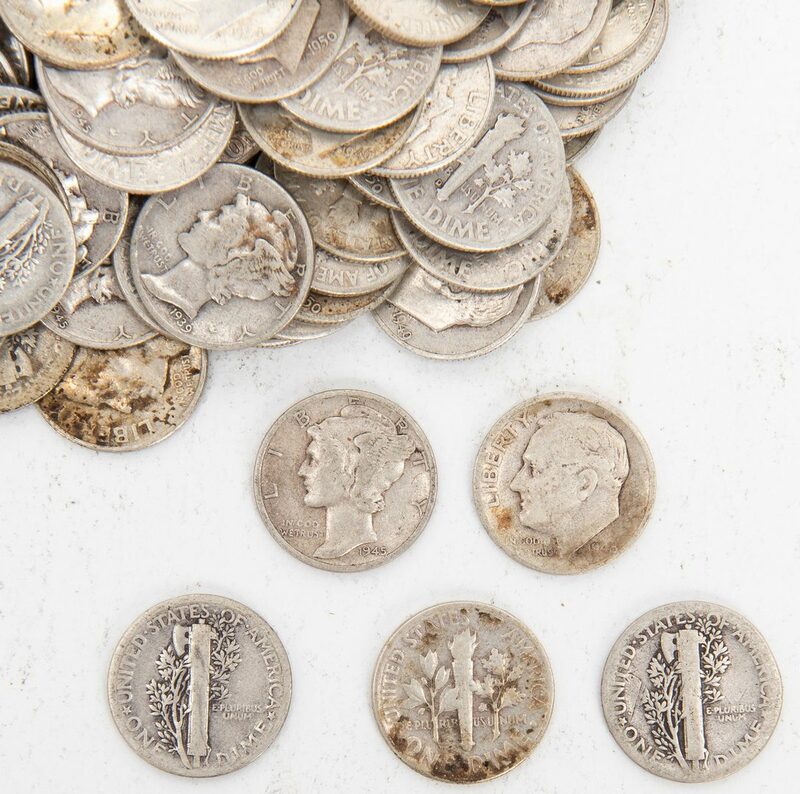 1st-229th items: Two hundred and twenty-nine (229) Mercury Dimes, including seven (7) 1916, eight (8) 1917, four (4) 1918, four (4) 1919, three (3) 1920, one (1) 1921, six (6) 1923, eight (8) 1924, five (5) 1925, eleven (11) 1926, ten (10) 1927, five (5) 1928, eight (8) 1929, one (1) illegible circa 1920, one (1) 1931, three (3) 1934, thirteen (13) 1935, thirteen (13) 1936, thirteen (13) 1937, five (5) 1938, nineteen (19) 1939, eleven (11) 1940, seventeen (17) 1941, eleven (11) 1942, ten (10) 1943, eighteen (18) 1944, and fourteen (14) 1945. 17.59 total troy ounces. 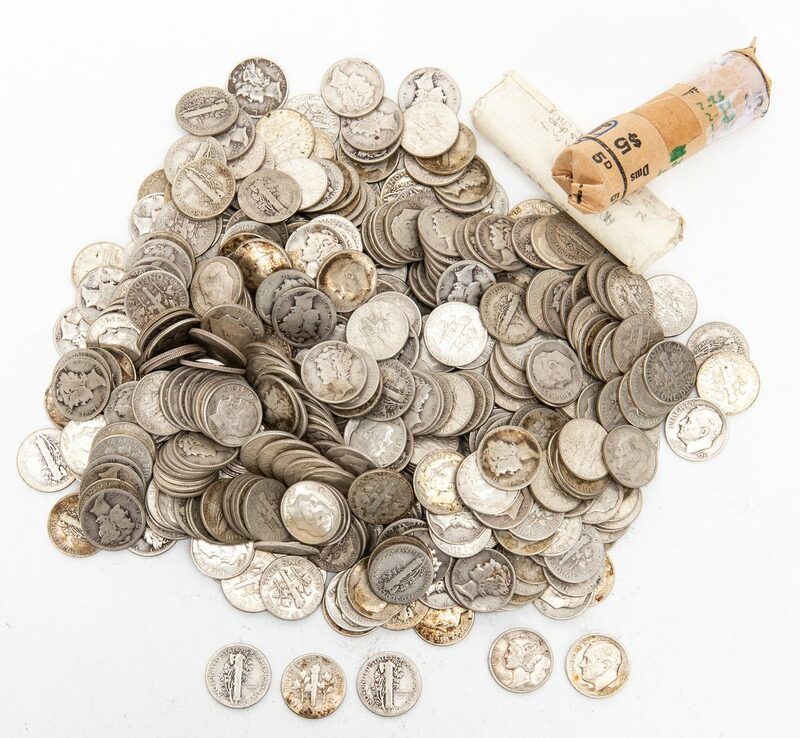 230th-279th items: Roll of Fifty (50) Mercury Dimes, including one (1) 1936, two (2) 1942, two (2) 1945, two (2) 1946, two (2) 1947, one (1) 1951, two (2) 1952, two (2) 1953, one (1) 1954, one (1) 1956, three (3) 1957, one (1) 1960, four (4) 1961, five (5) 1962, three (3) 1963, and eighteen (18) 1964. Approximately 3.90 total troy ounces. 230th-527th items: Two hundred and forty-eight (248) Roosevelt Dimes, including eighteen (18) 1946, thirteen (13) 1947, nineteen (19) 1948, fifteen (15) 1949, ten (10) 1950, ten (10) 1951, six (6) 1952, eleven (11) 1953, eight (8) 1954, two (2) 1955, four (4) 1956, nine (9) 1957, three (3) 1958, four (4) 1959, seven (7) 1960, eight (8) 1961, six (6) 1962, six (6) 1963, and eighty-nine (89) 1964. 19.75 total troy ounces. 528th-577th items: Roll of Fifty (50) Franklin Dimes, including two (2) 1946, four (4) 1947, two (2) 1950, one (1) 1951, three (3) 1922, one (1) 1953, one (1) 1954, one (1) 1956, three (3) 1957, one (1) 1958, two (2) 1959, three (3) 1960, five (5) 1961, four (4) 1962, ten (10) 1963, and five (5) 1964. Approximately 4 total troy ounces, approximately 45.24 total troy ounces for all coins. Provenance: the collection of Benjamin Dysart, Brentwood, Tennessee. 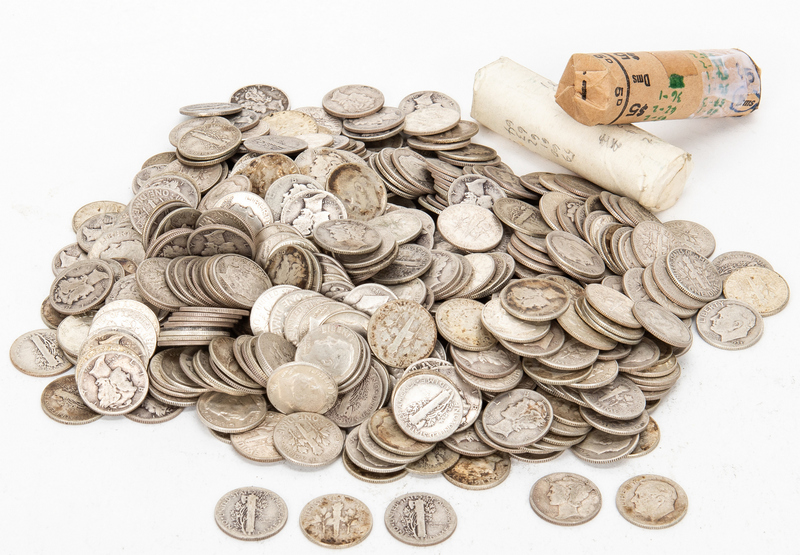 CONDITION: Majority of coins in circulated condition. 230th-279th items: Dates are recorded according to information on wrappers, appear to be in circulated condition. 528th-577th items: Dates are recorded according to information on wrappers, coins have not been examined outside of wrappers for date or condition.